Juicing for health is one of the oldest antiaging practices involving nutrition, but also one of the most effective. In order to make this concept work for you, you have to do two things. First find the best juicer for your individual needs, and second is to consume mainly vegetable juice, as fruit juices contain a lot of sugar. There is a lot of contradictory information out there about this practice, as to whether or not to juice. I think there is enough evidence that it is helpful, and if you use common sense regarding how your body reacts to things, freshly made juices are a good way to go! What I feel are the main advantages to using juices are that you are getting concentrated amounts of phytonutrients, which are rich in antioxidants and other compounds which protect your cells from free radicals and oxidation. Juicing for health is also an easy and convenient way to get the fruits and vegetables that you need to compliment your antiaging diet. Even though the extraction process removes the fiber, it is fiber you would not be getting anyway if you were not eating them! The main objection to using juices seems to be that they are a concentrated source of sugar, which of course means higher blood glucose and insulin, leading to fat storage in the body. This is only true if the juices you are making are fruit juices from highly glycemic fruits! Vegetable juice does not present this problem as it is far lower in sugars, while being loaded with all kinds of healthy nutrients in their natural raw state! Fresh juices are a great way to get raw food benefits that many experts extol as the foundation of a healthy diet! While we are on the subject of how glycemic these juices are, it would be wise for you to use both the glycemic index AND the blood type food lists to choose which fruits and vegetables to make your juices from. My recommendation that most of the juice you consume should be vegetable juice is based on the fact that fruit contains a lot more sugar, and even in it’s natural form sugar is problematic if you are trying to lose weight or are dealing with blood sugar issues! Please remember also that juicing for health, changes the glycemic rating of the fruits and vegetables you are using, so that the sugar content is even higher in their juice form than when you eat them whole. Lalane juicer shown on TV, spin a cutting surface which shreds the vegetable or fruit, trapping the pulp on a mesh screen and sending the juice into a receiving cup. 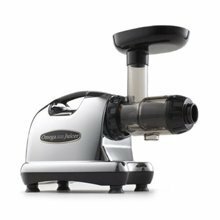 this type of machine, you must consume the juice right away, before the oxidation destroys the nutrient content and the juice spoils. The centrifugal type is faster and easier to use. Some models are very powerful and have large intakes so you can feed more fruit or vegetables into it at one time. These units are also cheaper than the masticating type. 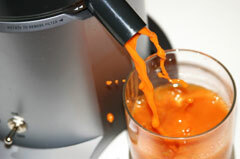 When juicing for health, the best juicer is the type called a masticating juicer. Masticating means to chew, and these machines have gears that grind the fruit or vegetables between the gears much like you use your teeth. The gears on these machines turn much slower than the spinning disks on a centrifugal machine and so almost no heat is generated, and the slow grinding action does not produce the oxidation of the centrifugal machine, thus the juice lasts a lot longer! 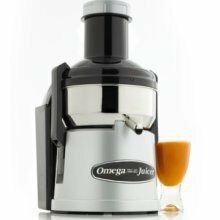 The masticating machine is both slower operating and more expensive than the centrifugal one, but all things considered it IS the best juicer, and if you are really serious about your health, it is well worth it. Due to its nutrient density, fruit and vegetable juice is a valuable addition to your antiaging diet. Pick the best juicer you can find and use the glycemic index and blood type food lists when juicing for health, and you will benefit greatly! Listen to Dr. Joseph Mercola expound on the benefits of juicing below!